give you some idea of the baroque nuttiness of it all. Terry Pratchett's Discworld novels might seem like a surprising leap from yesterday's entry, but you should not be fooled by 600-odd years' having passed: Christmas is still around. The great and wonderful thing about Hogfather, however, is that it takes Christmas, shakes it, turns it upside down and twirls it around, and then places it before you sprinkled with teeth. In a good way, of course. Pratchett writes what you might call ludic parody (from Latin ludere: to play). It is playful; not mocking, but a friendly kind of poking at familiar patterns. What makes it all so wonderfully textured is precisely the fact that it is not a parody of one pattern, but that it draws together a variety of texts in order to create something new. 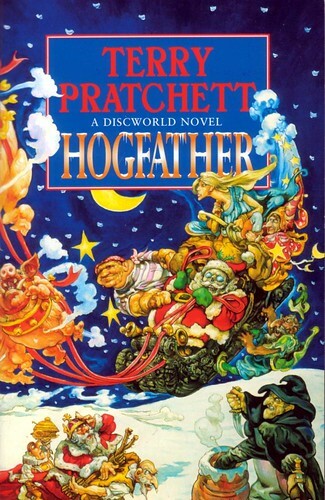 Having constructed the Discworld universe, Pratchett can then in turn use it as a backdrop for a series of shakings, turning-upside-downings and sundry similar treatments of other cultural patterns. This includes narrative conventions (the Disc's characters are well aware, for example, that an unarmed man facing an army has an unfair advantage; or that a one-in-a-million chance is the best shot at success); but it also serves as a backdrop for the historical and the political (with occasionally scathing social satire). And he speaks in small caps and separates people from their bodies. But an established aspect of Death as a character is his preoccupation with the human. Not the individual human, you will understand (though he is very friendly when he collects them), but rather the human condition. Which is why, when sinister forces are trying to make the world orderly and predictable by doing away with the messiness that the Hogfather brings to the world through his very existence, Death is the character that intervenes. Well, Death and his estranged (reluctant) granddaughter (don't ask; read, and ye shall find), Susan Sto Helit, who is a governess with a penchant for realism. You will, I am sure, catch the Mary Poppins reference. This is what Pratchett does. And this is why, while you may lose out on some Discworld texture if this is your first Discworld book, you will still get the pleasurable thrill of recognition that is so integral to reading them. ...one creature stirred. It was a mouse. The raven scratched its beak. "The rat says... The rat says: you'd better watch out..."
which I believe we can all sympathise with on occasion. And just in case you still have doubts, here is a bonus dreadful pun from Death to you. With love. let's get there and sleigh them. ho. ho. ho. In a final bit of news, I gather you have all been very good, as Good Omens is on radio this Christmas. If you have no idea what I am on about, we need to talk about some rather fundamental things. Denne boken er på listen min over bøker jeg skal lese.. Når jeg er ferdig med pensum. En gang i fremtiden. Den er på listen min også. Jeg har sett filmen (som jeg likte godt), men altså ikke lest boken. Kanskje denne julen? Jeg tror dessuten jeg skal prøve å begynne å tenke mer over hva jeg leser, og referanser og slikt. Mulig nyttårsforsett? I have actually read this book, although it's ages ago. Loving the Death character! Wonderful stuff.